MWPS World works with highly skilled re-manufacturers, refurbisher and machinists to ensure the re-manufactured equipment is properly restored to the original manufacturers specifications and is refurbished according to our high standards.Refurbished wind turbines offered by MWPS World are completely disassembled and thoroughly inspected and cleaned. Our highly experienced wind turbine refurbishment affiliates evaluate the condition of the reconditioned wind turbine and replace all wear parts. The main moving components will be reconditioned to new or better than new standards. The controls, gearbox, hub, generator, hydraulic system are all thoroughly reconditioned and are either restored or replaced. All refurbished wind turbines come with a full technical report of the reconditioning work undertaken and come with a standard 1 year warranty on replaced and refurbished parts and workmanship. Extended Warranty up to 5 years optional. Completed refurbished wind turbines are restored to the original manufacturers specifications and offer a minimum warranty of 1 year. Extended warranties may be purchased upon request. 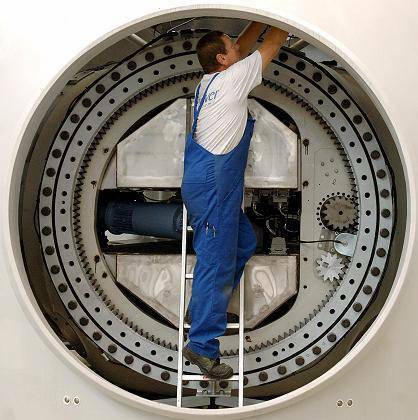 Depending on the turbine type and size, a typical reconditioning process takes approximately between 3 months and up to 1 year for very large size turbines. Tower/Head: Inspect/replace as needed welds, bearings, blast & paint, the unit will have new base bolts. Major axis and adjust on-axis coupling. Analysis of state of the 'I / F' with the hub, replacement of bearings and seals on hatches. Verification of tolerances in bearing seat shaft and bearings. Gearbox: Check the stage trains, both primary and secondary for backlash and endplay, replace seals and Verification of tolerances throughout the box. Hydraulic Systemcleaning and priming circuit pressure and leak test. Change seals, filters, fittings Verification of pressure level and vibration load, and repaint. Generator: Disassemble generators, dry and impregnate generator, re-dip armatures, and replace bearings. For small generator, check, adjust or replace belts. Test and adjust RPM sensor. Dynamic test analyzes noise and vibration and Thermal Verification test and paint unit. Instruments: Upgrade and test anemometer and wind vane. MWPS World can arrange to convert most wind turbine models to either 50Hz or 60Hz. If you decide to purchase a used wind turbine including refurbishing, please let us know at the time of inquiry and we are happy to provide a detailed price quote including a complete refurbishing schedule. Please contact us with any question you may have about the refurbishing you're your wind turbine. For more questions and information, please see our FAQ's - Click here!